Course Description: This course introduces basic features of the function by extending students' experiences with quadratic relations. It focuses on quadratic, trigonometric, and exponential functions and their use in modeling real-world situations. Students will represent functions numerically, graphically, and algebraically; simplify expressions; solve equations; and solve problems relating to applications. Students will reason mathematically and communicate their thinking as they solve multi-step problems. Students will begin with a review of arithmetic and other mathematical skills acquired in prior grades. They will study polynomials, with particular attention to operations performed on polynomial equations. Building on their knowledge of relations, they will explore the concept of functions. Finally, they will solve problems pertaining to rational expressions, drawing upon the skills acquired in the previous modules. Having acquired a firm understanding of functions and polynomial relations in the first unit, students will study one particular family of functions, quadratics, in detail. They will explore the various forms of the quadratic equation, and use strategies to convert equations to graphs and vice versa. They will explore the significance of the characteristics of quadratic functions. They will make connections between the numeric, graphical and algebraic representations of quadratic functions, and relate the roots of quadratic equations to the corresponding graph. They will investigate the utility of quadratic functions as models for a variety of real-world applications. One of the most obvious applications for mathematics in day-to-day Canadian society is the understanding and manipulation of money. This unit focusses heavily on this application, with particular attention to the mathematics of interest, annuities, investments and loans. 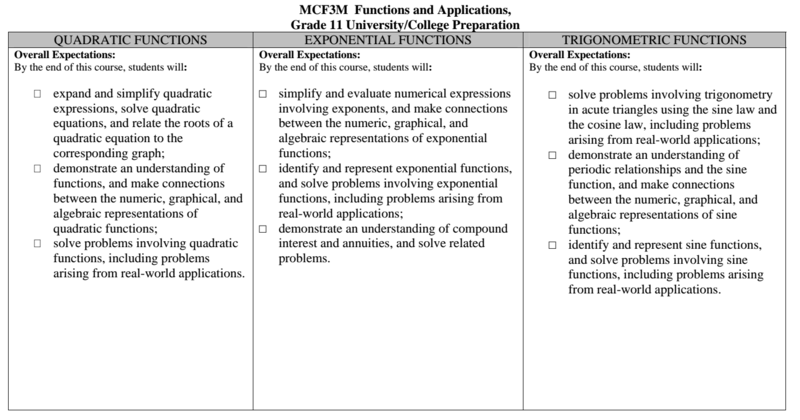 To do this, students will start by studying a special family of functions – the exponential functions – in depth. Before delving into money matters, they will use exponential functions to model a number of real-world phenomena, such as population growth and radioactive decay. As with quadratics, they will relate the numeric, graphical and algebraic representations of exponential functions. Finally, they will intensively investigate simple interest, compound interest, annuities, and solve realistic problems related to these tools of finance. Trigonometry was explored briefly in Grade 10, but in this unit it will be investigated with depth. Trigonometry, and trigonometric functions, are used extensively in sea and land navigation, survival situations, planning building projects, plotting and predicting cyclic phenomena, mixing music and exploring space. By the end of this unit, students will understand how to do all of these things at a basic level, and relate these applications to the numeric, graphical and algebraic representations of sine functions.